Go me. Well, Wifey Nadia helped a lot, so, go us. Prep time: 30 min. Cook time: 45 min. 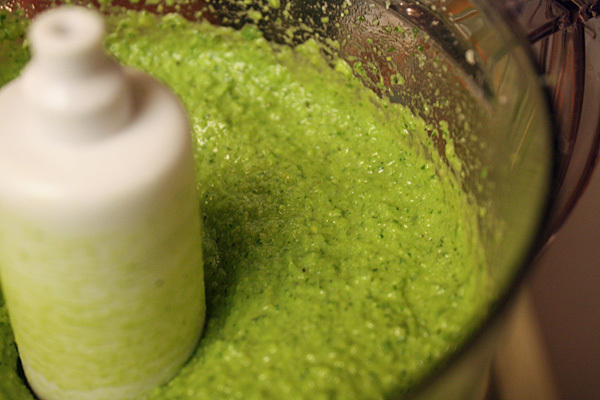 Since it’s the first day of Week 3, you’re going to prepare the pesto for the week’s recipes. 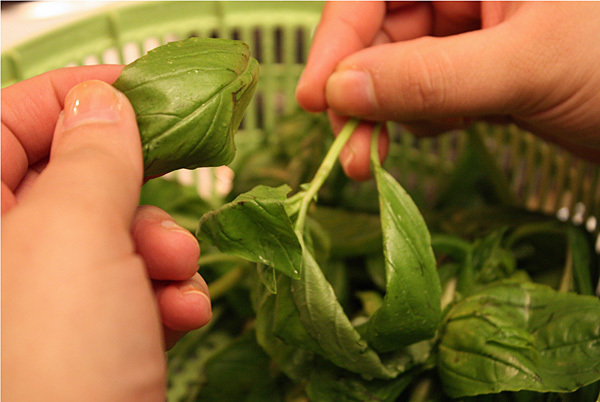 First, separate the leaves from stems on 2 bunches of basil. Save the stems on the side for the tomato broth. Roughly chop 4 garlic cloves as well. Combine with 1/4 cup of pine nuts, 3 T of olive oil and 1/2 cup grated Parmesan and blend until combined in a food processor. You’ll be left with a thick, bright green garlic-y paste that’s packed with cheese. 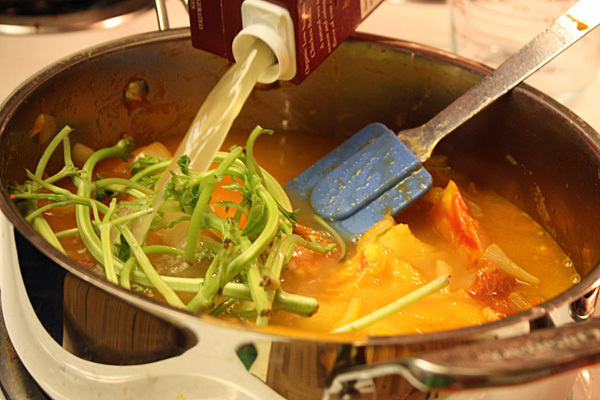 Once the pesto is done, you can start on the tomato broth. Roughly chop 1 yellow onion, 2 cloves of garlic and 1 lb. of heirloom tomatoes. 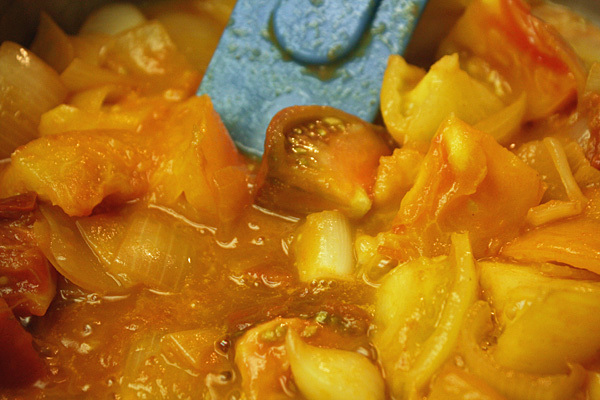 In a medium saucepan, heat 1 T of olive oil over medium-high heat and cook yellow onion and garlic for 3-4 minutes. Add 1 T of tomato paste and cook another 1-2 minutes, stirring frequently. The tomato paste will cook fast, coating the onions and garlic and sticking to the bottom of the pan. Deglaze the pan with 1/2 cup of white wine and reduce until nearly dry. Add the chopped tomatoes, turn down heat to medium, and cook 5-6 minutes. Toss in the basil stems and 1 quart of low-sodium chicken broth. 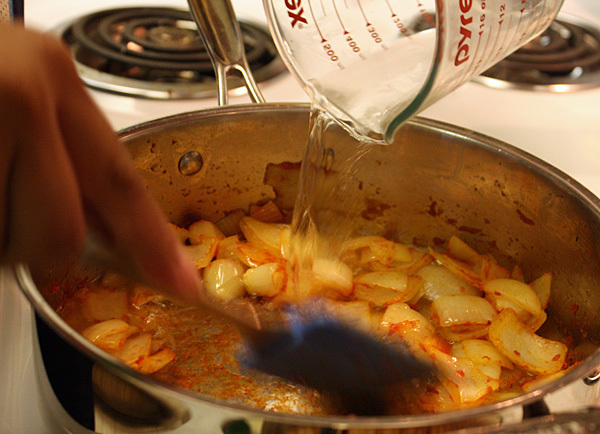 Bring up to a boil; once it starts boiling reduce heat to low and simmer for 25-30 minutes. Season with salt and pepper and strain, separating the broth from the veggies inside. Discard the veggies and stems when you’re done. Preheat your oven to 400 degrees before you prepare the veggies for the broth. Grab all of your chopped up veggies cause you’re gonna need ’em now. 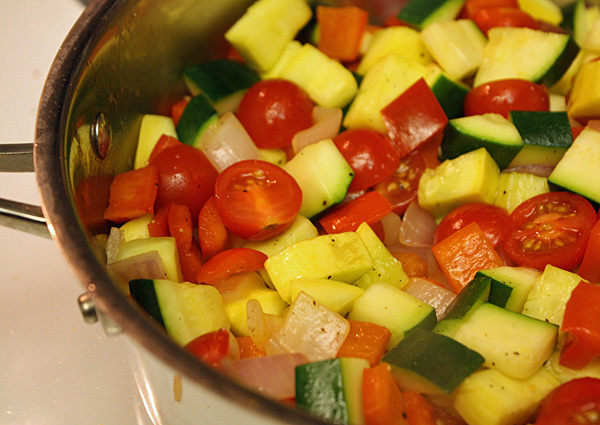 In a large saute pan, heat 1/2 T of olive oil over medium high heat and cook bell pepper and onion for 2 minutes. Add the squash and zucchini and saute for another 2 minutes. Add the cherry tomatoes and cook for 1 more minute. At this point, you can add salt and pepper, to taste. Turn off the heat and stir together. 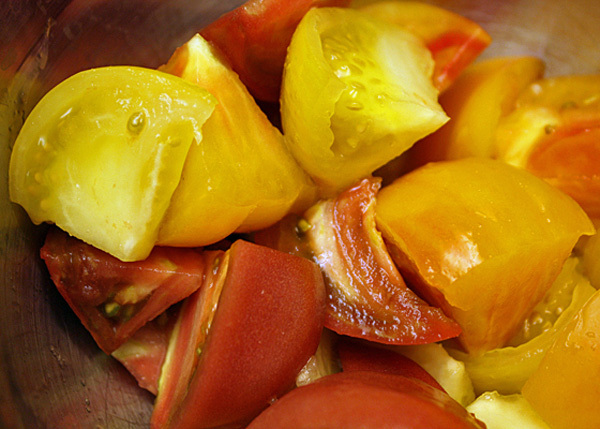 The veggies should still have some crispness to them, and the tomatoes should be warm and soft. Heat other 1/2 T of olive oil in a medium saute pan. Season sea bass with salt and pepper. Add fish to saute pan and cook for 1-2 minutes skin side up (if there is skin on it, mine didn’t have any). 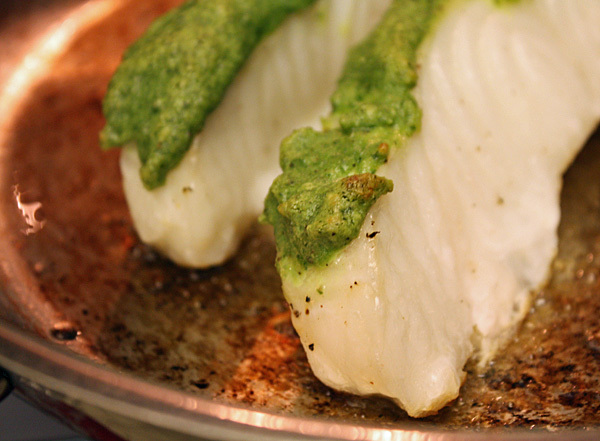 Flip and top fish with 1 T of the pesto sauce. Place pan in the oven and cook until fish is cooked through. My pieces were thin and long and took 6-8 minutes. To plate, spoon 3/4 cup of veggies into a bowl. Laddle in 3/4 cup of broth and top with roasted fish. I thought the crisp veggies would get in the way, but they cook a little more, without losing too much bite, in the hot tomato broth. The buttery sea bass flakes off the filet and is so rich and satisfying. 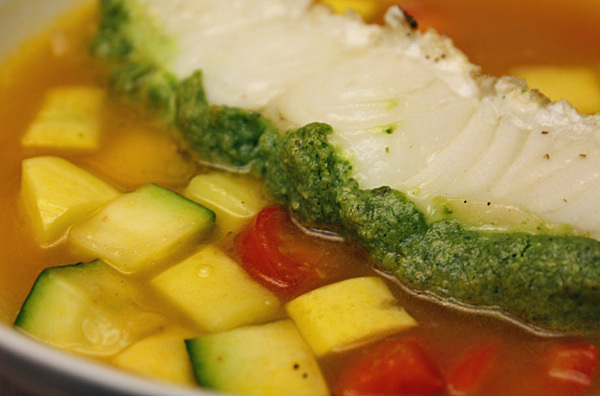 The cheese in the pesto paste kinda melts onto the fish, leaving this cheesy, herbaceous layer of flavor that brightens both the fish and the tomato broth. This is a very light meal that is unbelievably satisfying. Pair with some of that leftover wine and a cold winter night and enjoy the fruits of your labor. This is a very healthy diet and very detailed. Good Job. This looks delish, except I’m not crazy about squash and zucchini. What do you think I could substitute? You could probably do some tofu, carrots, and celery. Although it might change the flavor profile a bit. Claudia: Dan has good suggestions, but maybe instead of both squash and zucchini just use squash or zucchini? And up the cherry tomato count by 1.5X? So you’re reducing the amount of squash but upping tomatoes maybe? Wow, that does look fishgasmic! I can’t wait to try it. Lol. If you do make it, lemme know how it turns out Genevieve! You could buy some of your fish and veggies at Asian, Persian or Mexican markets and that will help with your grocery bill! If you’d like to know where some convenient ones are in south OC, let me know. And yay on losing some more lbs!! Used cod loins for this dish. Followed all the recipe, but had a few variations. I reduced the broth, but added a teaspoon of xanthan gum to make the sauce less watery. Low carb, as opposed to using starch as a thickener. The broth had an excellent flavor, so I wanted it to adhere more to the veggies, rather than it being a soupy broth at the bottom of the dish. Also, pan fried the fish, broad side down, (one side of the loin was flat, the other rounded) in a T of sesame oil. Initially frying the broadside down opened the flakes on the loin. When I baked it a 400, I laid the broadside of the loin up. This placement provided a huge, cranny laden area to smather the most excellent pesto sauce. 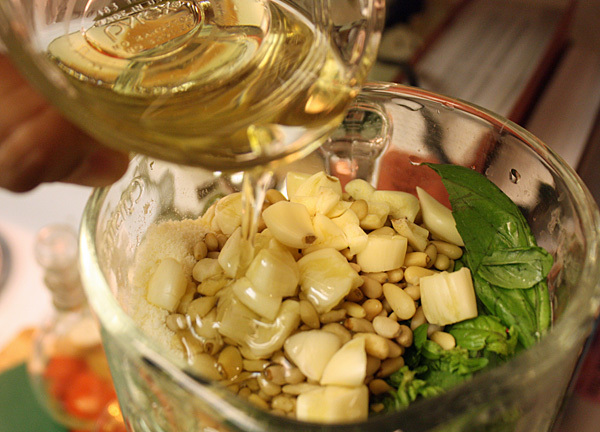 The sesame oil added to the nutty flavor of the pesto. Most excellent recipe. A higher carb recipe would just entail no veggies, but a bed of brown rice, smothered with the thickened broth. The veggies were great though, as the in-laws provided me with some fresh IA squash and zuch. OK, also at the end, when plating, grated some fresh (snoby whole food cheese counter) parm.